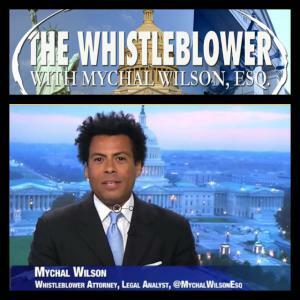 LOS ANGELES, CALIFORNIA, UNITED STATES OF AMERICA, July 6, 2018 /EINPresswire.com/ -- The whistleblower journey of Mychal Wilson, Esq. will premiere primetime Friday, July 13th at 8/7c on CBS. The premiere episode will feature the cases concerning pediatric dental chain Kool Smiles and Celebrity Whistleblower Attorney™ Mychal Wilson’s whistleblower journey against his former employer pharmaceutical giant Bristol-Myers Squibb. "I would like to thank CBS, Emmy Award winner and Senior Executive Producer Susan Zirinsky (48 HOURS, 48 HOURS: NCIS), Executive Producers Alex Ferrer, Ted Eccles, Gail Zimmerman and Allen Alter, Producer Caroline Sommers, and Director of Photography Leigh Hubner for the opportunity tell my story," says Mychal Wilson, Esq. Mychal Wilson, Esq. is now a successful relator and Qui Tam attorney who has assisted various Federal and State agencies in the recovery of over $580 million in American taxpayer's dollars, who recently launched his new 30 minute news series titled "The Whistleblower” with Mychal Wilson, Esq. Attorney Wilson’s own show titled "The Whistleblower” is a weekly nonpartisan political news program which airs every Tuesday live at 10:00 pm Eastern and 7:00 pm Pacific, on Roku, Amazon Fire TV, and coming soon on Apple TV, DISH TV and on demand thereafter. Legal Nostradamus® Mychal Wilson and Hollywood Legend Morgan Brittany Discuss #MeToo on "The Whistleblower"